Package includes resort accommodations for number of nights selected & round-trip ferry service. * Is your travel date within 48 hours? * After the first two adults, are any travelers 12 or under? 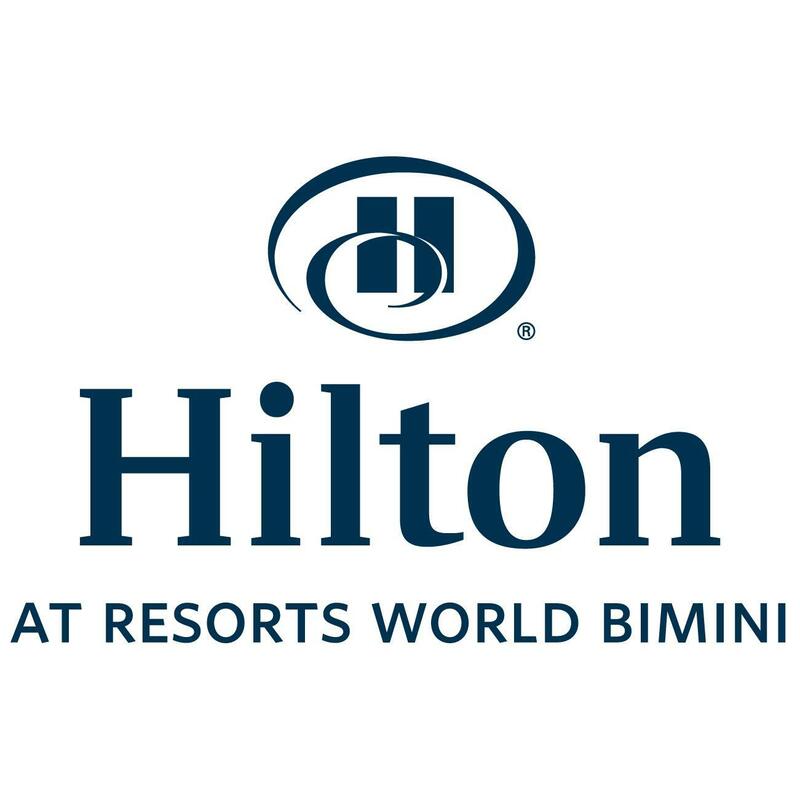 The highly anticipated all new Hilton at Resorts World Bimini is now complete. Experience a side of The Bahamas you never thought possible. With incredible new amenities including a ground floor lazy river pool overlooking Bimini Bay’s crystal clear turquoise water, world-class spa, more than 10,000 square feet of new event and meeting space and six new restaurants and lounges, the Hilton at Resorts World Bimini is unlike any other hotel in The Bahamas. This luxury experience will begin from the moment visitors walk through the doors of the exquisite new lobby featuring sleek, modern décor and state-of-the-art details. The new phase of the hotel also includes rooftop, poolside dining options that offer healthy choices such as fresh juice and fruit along with grilled favorites. Whether walking or swimming up, the Oasis pool bar, located on the ground floor, is the place to indulge in a selection that includes fresh conch salad, quesadillas, Paninis, burgers, hotdogs and more. With more than 10,000 square feet of new meeting space offering incredible views of Bimini’s iconic water, groups booking at the Resort can expect the style and personalized service that has become synonymous with the Hilton brand, which has won international awards for being the number one provider of meetings services. From grandiose galas and meticulous meetings to private parties and social soirées, every meeting and special occasion will be treated as the main event at the Resort. For ultimate relaxation, the Hilton at Resorts World Bimini provides a totally transforming experience in the new Serenity Spa. World-class services and amenities include massages, facials, hand and foot therapies, nail services, salon services and make up artistry. To complement these highly personalized services, premier products are available to enjoy long after departing the luxury boutique spa in Bimini. Introducing the new Bimini Fast Ferry with service from Miami, Florida to Bimini, Bahamas. The Bimini Fast Ferry has a capacity of 427 passengers and features both economy and business premium seating. 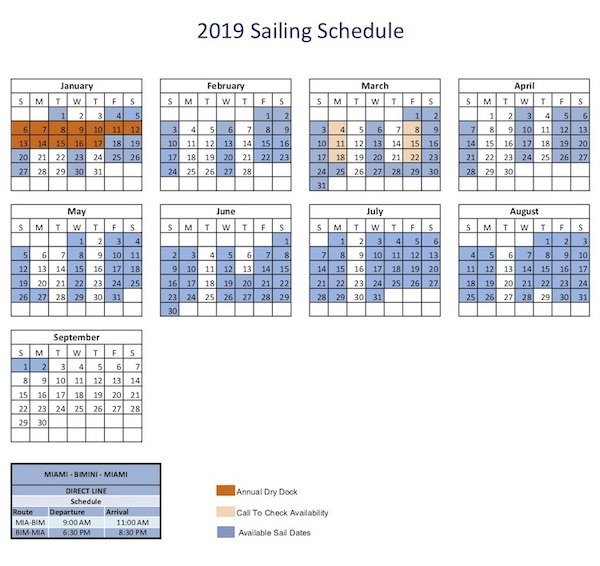 The current schedule offers sailings on Friday, Saturday, Sunday and Wednesday most of the year, with more frequent sailings during July, August and around the holidays. The Bimini Fast Ferry offers one-way service, day trips (over and back same day) or split dates (depart one day and return another). To check your departure terminal visit this link. The departure terminal may change. Be sure to verify your departure terminal the day of departure. RESORT FEE OF $25 PER ROOM, PER NIGHT MUST BE PAID DIRECTLY TO HOTEL UPON CHECK-IN AND IS NOT INCLUDED IN PACKAGE PRICE. Only personal belongings are considered to be luggage. *Each passenger may take one carry on piece of luggage free of charge. The carry on item must be no larger than 22 x 11.5 x 9 and weigh no more than 25 lbs. Items exceeding these dimensions or if you have additional luggage an additional charge of $25.00 per piece will apply. Any additional luggage fees must be paid at the port at the time of departure. Passengers with cargo items (large items that that do not fit in a suitcase, such as dive equipment, bicycles, etc.) must drop these items off at the warehouse the day before your sailing. Please be mindful of the days the warehouse will load your items onboard before you book your sailing. ALL items, baggage, etc must be labeled with the passenger’s full name and address. Unclaimed baggage with be held for 10 days at owner’s risk and expense and will be discarded after that period of time. **Rates may be higher during peak season periods, based on availability, class of seating and other factors. Port taxes, Bahamas departure fees and service fees will be added to your final rate before check-out. Any account credit balance may be used towards a future booking within 12 months of the date of your initial booking or transferred to another traveler when traveling in groups of 10 or more. Travel insurance is highly recommended and available upon request. In most cases, travel insurance covers 100% of your package price should you need to cancel a confirmed reservations for a covered reason and as long as you meet the qualifications and terms of the insurance policy. My family and I have been going to Bimini for years. It's close to the states but flights can be a little pricey. Until recently hotel rooms were modest and had a laid back and retro feel. This has all changed within the last year with the new ferry service from Miami and the opening of the fantastic Bimini Hilton! It seems no one really knows about this place because it's not Nassau or Freeport but Bimini (in the Bahamas) is one of the most beautiful and interesting islands of them all. You can be there by fast ferry in just 2 hours. It's an inexpensive, no frills fast ferry but for the price it can't be beat. When you set foot inside the Hilton you won't believe your eyes. No more retro style motel...Instead you're in a 5-star world class resort with all the amenities you'd expect, rooms that are luxurious and spacious and more restaurant, bars and entertainment options than you would expect. Plus, there's now a casino on site. I would highly recommend this travel package with the Hilton and ferry! I know we will be going back again and again. Click the button below to add the Bimini Cruise & Stay | Bimini Fast Ferry with Bimini Hilton to your list and contact a travel agent.